As an adult, learning to swim is as much a mental challenge as it is a physical challenge. Often, we get to know from our pupils about that one unpleasant experience with water as child, which shapes their lifetime fear of water. The good news in your case is that you have already taken the first steps to overcoming any apprehension by finding Swalings. We will help you overcome any initial fears and anxieties and help you develop the skills needed to become a confident swimmer. Our teachers are highly experienced and help you find the balance between establishing a calm, reassured approach and building your confidence by developing your ability to swim. They will guide you out of your comfort zone into a new sense of freedom that comes with being a confident swimmer. 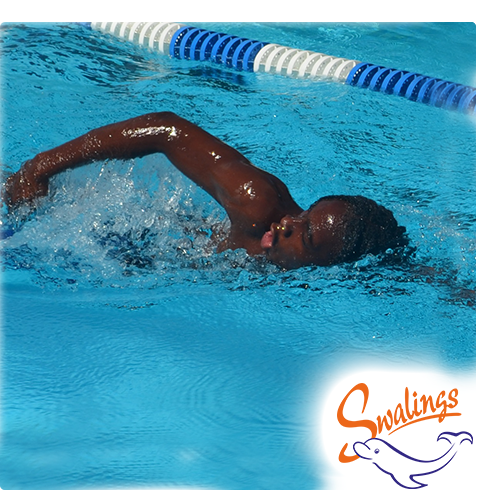 Our teachers are there at every step to guide the swimmers and thus they get into the water to help build your confidence and reassure you as a swimmer. Becoming an adult swimmer can be a life changing experience and open up a world of opportunities. So you have the basics of learning to swim…. but you feel there is something missing. Maybe you want to sustain your stamina to swim longer distances. Maybe you want to improve your arm technique or you may have committed to a sporting event or a charity swim and wish to increase your swimming speed. Whatever your personal goal maybe, our highly qualified teachers are on hand to help you achieve them. We have group or private lessons available.